Explanation: Astrophotographer Michael Horn captured this gorgeous view of comet SOHO in the dark night sky above Wandibindle, Queensland, Australia on May 23rd. 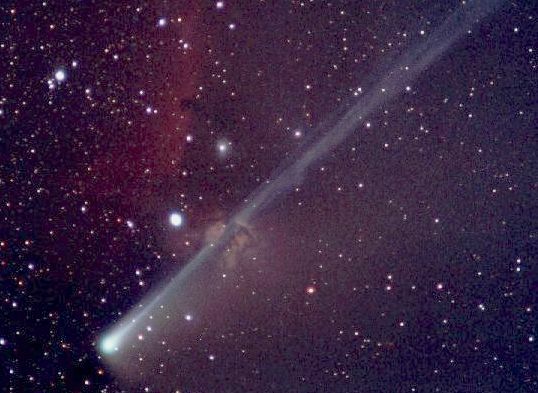 On this date, comet SOHO was moving against the background of the nebula-rich constellation of Orion. South is up in the picture which shows SOHO's bright head or coma and long tail extending past the glowing gas clouds and dark dust lanes of the Flame and Horsehead nebulae. Alnitak, the bright star above and to the right of the cometary coma, is also known as Zeta Orionis, the eastern-most of the three stars in Orion's belt. Southern Hemisphere observers report that comet SOHO has recently undergone a dramatic increase in brightness.